The most distinctive feature of this dabbling duck* is the large, spatula-shaped bill. This bill is ideally suited for straining small swimming invertebrates from the water. Northern Shovelers feed primarily by holding their bills in the water while swimming, straining out food as they go. In Tennessee, they are most easily found during migration, with smaller numbers over-wintering in the state. They breed from northern Alaska through the prairies of central Canada southward to central California and New Mexico. In winter they range from the southern and southwestern United States to western Central America, and the Caribbean. This species also breeds in Eurasia from Britain to Siberia, wintering in southern Europe, Africa, and southern Asia. Description: The long spoon-shaped bill is wider at the tip than at the base. The male has an iridescent green head, a white chest, rusty sides, and a black bill. The female is grayish-brown overall, with an orange-tinged gray bill. In flight, males and females have a light blue upper wing-patch with narrow white border, and an iridescent green trailing edge. Voice: The female’s quack is deep and hoarse. The male gives a nasal bray during fall courtship. The very large bill of the Northern Shoveler distinguishes it from all other dabbling ducks. Male Mallard has an iridescent green head, but has a chestnut-colored chest and a smaller greenish yellow bill. 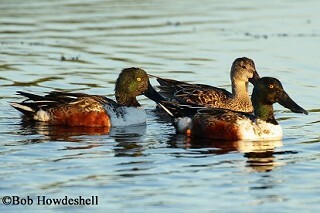 Blue-winged Teal and Cinnamon Teal have similar wing patterns in all plumages, but are smaller with much smaller bills. Cinnamon Teal are extremely rare in Tennessee. Habitat: Migration and winter habitats include marshes, shallow ponds and lakes. Diet: Small swimming invertebrates and some seeds. Status in Tennessee: The Northern Shoveler is a fairly common migrant and uncommon wintering duck in the state. They arrive in late August and become less numerous during the winter. Spring migrants arrive as early as mid-February and most birds depart by early May. The bill of the Northern Shoveler is larger than any other North American duck. It over 100 lamellae (fine tooth-like projections) along the edges, for straining food from the water. Northern Shovelers form pair bonds that last longer than most dabbling duck species. The oldest known Northern Shoveler in the wild was 18 years, 7 months old. Best places to see in Tennessee: State and federal waterfowl refuges including Lauderdale Refuge, Reelfoot Lake, Cross Creeks NWR, and others. Dubowy, P. J. 1996. Northern Shoveler (Anas clypeata). The Birds of North America, No. 217 (A. Poole and F. Gill, eds.). The Academy of Natural Sciences, Philadelphia, PA, and the American Ornithologists' Union, Washington, D.C.